Runners are creatures of habit. We get our daily 3 miles of 6 miles, at dawn or after work. We’re satisfied with our dedicated regularity. But what if we could do more? 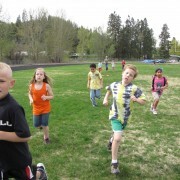 Running, at its best, is infectious and permeates every part of our lives. There have been times in my life when my running took me places I needed to go. In grad school, I was living in St. Paul, Minn., and had one class in Minneapolis. Since campus parking was a nightmare for a thrifty grad student, it made perfect sense to run 4 miles each way with a pack snug on my back. I’d wipe the sweat off my brow as I took a seat and pulled out my statistics book. 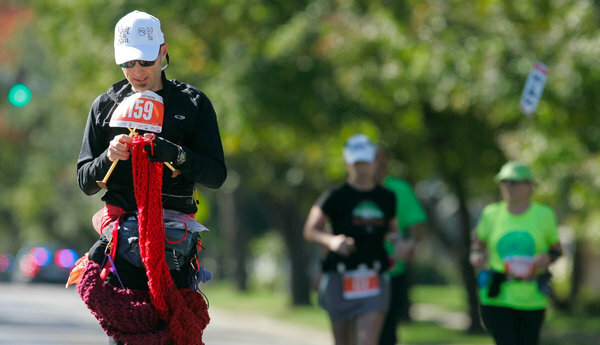 Knitting while running? Why, of course. When my children were of ‘towable’ size, the baby jogger served as my runner’s panniers for all sorts of errands. We would run to the library to drop off books, or to the post office for stamps, or to the market for whatever could squeeze into the pocket below their rumps. The passengers appreciated the stop to get out and stretch their legs before the scenic ride home. Before Alice was in school full-time, she would accompany me to take Quentin. Alice had an early awareness of my love of running and she wanted to be a part of that. So as we stepped out of the school building to return to our car, we’d lower into a sprinter’s position and after “Ready, set, go,” we’d be off to see who could tag the stars on the car’s insignia first. I miss our daily races now that I return to my car alone. There is a local runner that inspires me. I don’t know her, but she is instantly recognizable. 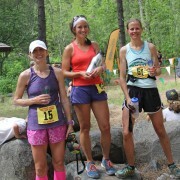 Tall and thin, even for a runner, her posture is upright. She is a creature of pacing, with every short stride identical to the last. Her arms draw my attention, because they swing low, methodically with every step. And in her hands, more times than not, she carries bagged groceries. The bagged ballast shifts just slightly; she has run with full hands so many times that she performs her movements precisely. It begs the question, why does she run with groceries for several miles? Although I haven’t had the opportunity to ask her why, I think I know. The answer might simply be stated, “Why not?” When given a chance to get from point A to point B why not run if time permits? If running brings us so much pleasure, then why not run to accomplish other things as well? I love this logic even though I am unable to fully live that ideal. I can’t run my kids to school in the morning because I can’t carry their combined 120 pounds. Even if I had superhero strength, we would have to leave so early that they would be undernourished grouchy zombies. I combine my shopping trip with the school drop off, so I also cannot justify running 8 miles round-trip for more groceries later in the day. But what can I do to embody the spirit of running beyond my regular runs? Have you seen a movie in which the hero has to dash across blocks of traffic-jammed streets in his or her street clothes? Doesn’t your heart swell to see them breaking the norm for the sake of some dire emergency? Well, why can’t we give into the urge to run, no matter our attire or our location? I still try, in little ways, to do just that. My mailbox is down the driveway and a short stretch of road. Getting the mail means taking a step or two and then plunging into a run. With mail in hand I figure I might as well run back up the hill and enjoy bounding up the last bit of gravel. While in Disneyland my whole family jogged for stretches to get to our tickets and we packed in double the number of rides of the average strolling family. Seriously, it’s more fun to be on the rides than standing in line for them. I found myself recently in the rat’s maze of Ikea, and I bolted through department after department to get to the desk furniture, passing latte drinkers and baby strollers left and right. My ability to run and my lack of embarrassment saved me considerable time. Jogging through the store was also way more fun than lollygagging over furniture I didn’t need. The opportunities abound for us to run. Whether for a few minutes or a few seconds. We can reach our destination quickly. But more importantly, we get to have the thrill of running more often. Few of us can take our running to the level that a committed bike commuter takes her cycling. But I will strive for less time in my car and more on my feet, running.